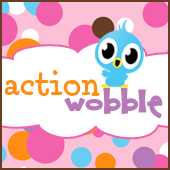 This is Melissa with Moe Creations, check out this cute Valentine's Day card I made for the Action Wobble Blog!!! If you haven't made all of your Valentine's cards, her is a little inspiration. Now you can use any dog image you would like, but there is only one action wobble and you can purchase yours here!!! I hope you enjoyed my card!! !